They crowded in for the hot dog show. An Oscar Meyer wiener, serving as proxy for a finger, was pushed into the spinning blade of a table saw. The demonstration, at the International Woodworkers Fair in Atlanta, mimicked the way gruesome table saw injuries often occur. But this saw was equipped with a safety device called SawStop that allowed the blade to distinguish between wood and flesh, and to stop fast enough to prevent serious harm. Sure enough, the blade came to a dead stop in about three one-thousandths of a second, leaving the dog with only a minor nick. 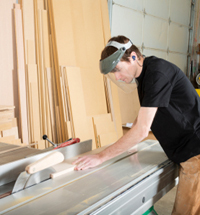 Table saw accidents are painful, life-changing and expensive. Each year, more than 67,000 U.S. workers and do-it-yourselfers suffer blade contact injuries, according to government estimates, including more than 33,000 injuries treated in emergency rooms and 4,000 amputations. Gerald Wheeler had other numbers on his mind as he watched hot dog meet blade that day in August, 2002. As the operator of a wood shop in Hot Springs, Ark., he was all too aware of the unforgiving nature of table saws. Not long before, two of his employees had been maimed within a few weeks of each other. Wheeler felt awful about the injuries, the loss of two good workers, the $95,000 in medical bills, the doubling of his workers compensation rates. Wheeler thought: If only this had come along sooner. He took out his Visa card to order two of the saws, but was told none were available. As the SawStop guys explained, they had been seeking licensing deals with the big power tool makers, but had found no takers. Faced with the prospect of never getting the invention to market, the little company, also known as SawStop, eventually started making its own saws. Since they first went on sale in 2004, SawStop says it has recorded 2,000 “finger saves”—customer reports of accidents likely to have caused disfiguring injuries with conventional saws, but that resulted in minor cuts or a few stitches at most (SawStop acknowledges two reports of amputations). However, SawStop still makes the only saws with skin-sensing technology, and accounts for a tiny fraction of sales. Tens of thousands of fingers have been sliced off since the system was invented, but the rest of the industry, which is self-regulating, has been allowed to go on as before. Over the years, top saw makers and the Power Tool Institute, their trade group, have defended the design of their saws and the decision to snub SawStop. They’ve argued that injury numbers have been inflated and that the government’s estimate of $2.36 billion in annual costs to society from table saw accidents—including medical bills, lost wages, pain and suffering—is exaggerated. They say the market for popular, lightweight saws costing as little as $100 to $200 would be destroyed by the added expense of SawStop. They note that under some circumstances, SawStop can stop a blade without skin contact–such as when the blade touches conductive materials like metal or very wet wood. In such cases, the owner usually has to replace the blade and an electronic cartridge. But as court records and testimony have shown, the companies rejected the safety advance for another reason, too: They worried that if a way to prevent severe injuries got traction in the market, they would face liability for accidents with conventional saws. Even so, they have had to defend lawsuits. About 150 have been filed in recent years, focusing on the companies’ decision not to use available safety technology. The industry is also trying to keep the Consumer Product Safety Commission from requiring injury reduction systems on all table saws—either SawStop or something similar. Indeed, another firm, Massachusetts-based Whirlwind Tool Co., says it has developed a “proximity detection” systems that will shut down a saw when a hand comes close to the blade. But the industry may have little to fear from the commission. The agency has been wrestling with the issue, on and off, for 15 years. So far, its most definitive act has been to give SawStop an award for safety innovation. It will be at least next year before the agency adopts a regulation, if it ever does. The SawStop story is about an industry’s ability to resist a major safety advance that could, by now, have prevented countless disfiguring injuries, but might have been bad for business. It highlights the endless due process that makes it virtually impossible for regulators to enact safety measures over the unified objections of industry. It’s also something of a David-and-Goliath story–though in this case David, rather than carry a sling, is armed to the teeth with patents. Stephen Gass is energetic and intense, a trimly built man of 49 whose home near Portland, Ore, is a manageable drive from some of his favorite whitewater kayaking runs. He grew up on a horse farm in Eastern Oregon, and was taught woodworking by his father. He earned a doctorate in physics and a law degree, then joined a patent law firm in Portland, but retained his interest in building things. Stephen Gass, president of SawStop, LLC, at company headquarters near Portland, Ore.
Gass created an elaborate workshop behind his house. For some reason, while out there on a fall day in 1999 he was struck by a question: Would it be possible to stop a saw blade quickly enough to keep it from slicing off your fingers? After a series of calculations and with parts you could buy at Radio Shack, he showed it could be done. The invention involves running a weak electrical current through the saw blade. When a person comes in contact with the blade, the body absorbs part of the signal. An electronic sensor detects the change in current and activates a spring. The spring jams an aluminum wedge between the teeth of the blade, which acts as a brake. The blade also drops below the surface of the table. It all happens in so few milliseconds that, unless the hand is moving unusually fast when it hits the blade, the injury typically is minor. One of the mysteries is why the power tool industry, with its engineering prowess, didn’t invent SawStop before Gass did. Maybe he was smarter. Or maybe the industry didn’t do it because it didn’t need to. There were no clear financial or legal incentives. Table saws are a must-have tool for millions of construction workers, cabinet makers and do-it-yourselfers. In the U.S., there are about 9.5 million of them in use, according to industry figures. Of about 500,000 sold each year, 85 percent are supplied by members of the Cleveland-based Power Tool Institute, including such well-known brands as Black & Decker, DeWalt, Makita, Skil, Bosch and Ryobi. Saw designs are governed by a voluntary standard worked out between an industry-dominated technical committee and Underwriters Laboratory. When SawStop came along, the voluntary standard called for a guard that fit like a hood over the blade. Because a hand can slip under the guard, many thousands of injuries occurred even with the guard in place. Usually, however, the guard wasn’t being used. Because it limited visibility, had to be removed for certain cuts, and took a long time to detach and put on again, most people worked without it. Critics said the guard did more to protect the manufacturers than users. Members of the Power Tool Institute insisted there was nothing wrong with the guard. Following a December, 1999 meeting, Paul summarized their position: “Education is the only way to affect the injury hazard patterns seen. Education, not redesigning the guard, is needed to convince the operators to use the blade guard.” The institute pledged to do its bit by making a video. SawStop wrecked this way of thinking. Saw makers now had the ability to prevent the tragedies they knew were going to happen, that had always happened. For this reason, Gass thought, his invention should be an easy sell. “I couldn’t imagine that anyone would not want to put this on the saws that they were offering to people,” he said. Hoping to stir grass-roots interest, Gass and the Davids made their first trip to the woodworkers fair in August, 2000. They were sent to the nosebleed section—a tiny booth in a conference room on the third floor of the Atlanta Convention Center. But as word of the hot dog demonstration spread through the fair, they were soon drawing crowds. SawStop was awarded a top prize for technological advancement. Saw makers also took notice and issued invitations. Soon Gass and his partners were visiting corporate offices of Emerson Electric; Black & Decker (now Stanley Black & Decker), Ryobi and Bosch. In November, 2000, they briefed members of the Power Tool Institute in Cleveland. Their prospects seemed to rise when CPSC engineers, in July, 2001, announced the results of a technical evaluation. “The SawStop concept is valid and the prototype impressively demonstrates its feasibility.” Ann Brown, then head of the agency, awarded SawStop a Chairman’s Commendation for safety innovation. Negotiations were held with several companies. Talks with Ryobi advanced farthest, then collapsed under mysterious circumstances. A leading manufacturer and supplier to Home Depot, Ryobi is based in Anderson, S.C., and is a subsidiary of Techtronics, Inc. of Hong Kong. In January, 2002, Ryobi sent SawStop a signed licensing agreement. It called for Ryobi to investigate SawStop’s feasibility, and to incorporate it in Ryobi saws within 18 months if it proved feasible. SawStop would get a royalty equal to 3 percent of the wholesale cost of each saw, with the fee rising as high as 8 percent should the technology be widely adopted. Gass said a small typo led him to return the contract to Ryobi’s general counsel, who Gass said told him he would immediately fix the mistake and mail the contract back. Days turned into weeks, then months. Gass said he got repeated assurances that Ryobi wanted to proceed, but the contract never came back. Gass recalled being told by Peter Domeny, then chairman of the committee and Bosch’s director of product safety, that SawStop had kept him awake nights wondering how the industry could defend itself in court. Domeny was questioned about this in 2008, when his deposition was taken in the case of a Pennsylvania man who suffered the amputation of four fingers. “We had discussions as far as the liability implication, but not in that form as he [Gass] quotes it,” Domeny replied. “I don’t think I have discussed my sleep patterns with Mr. Gass.” Domeny declined an interview request. Early on, Gass and two of the Davids had quit the law firm to give full time to SawStop. Having failed to license the technology, they faced a stark choice: Either go back to patent law and let the invention die, or find the capital to make their own saws. They chose the latter, Gass said, and raised $3 million from about 30 investors. The joint venture ended in 2009, when members said they had developed a system superior to SawStop. It has yet to be incorporated into a single saw. Their system is designed to retract the blade into the table immediately on skin contact. Unlike SawStop, it does not use a brake, which can damage the blade. Representatives of Ryobi, Black & Decker and Bosch did not return calls about when, or if, the technology will be used. Industry comments filed with the CPSC asserted that SawStop’s patents were holding them back–potentially forcing them to pay royalties or engage in expensive patent litigation to introduce their system. 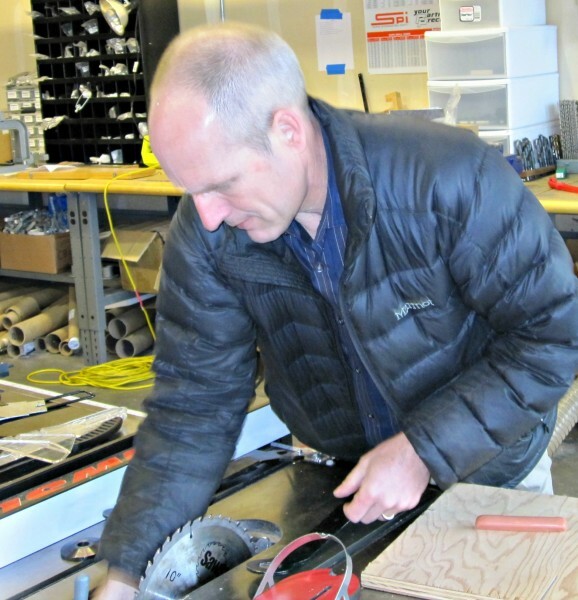 SawStop, for its part, put its first saws on the market in 2004 and has sold about 40,000 since. Along with flesh-detection technology, the company’s saws came with an important safety device called a riving knife that had been mostly limited to models sold in Europe. A riving knife is a curved steel blade that cuts the risk of “kickback”, which occurs when a piece of wood suddenly jerks while being cut, sometimes pulling the operator’s hand into the blade. Gerald Wheeler, who had been wowed by the hot dog show, got two of the first saws. In March, 2006, Carl Seymour, a foreman at his shop, accidentally touched a whirring blade. A photo on SawStop’s website shows Seymour beaming in triumph as he lifts the wounded thumb, which looks like it has a paper cut. No longer having anything to lose, SawStop fired another shot. It organized a petition signed by more than 300 woodworkers, shop teachers and others, asking the CPSC to regulate. Filed in April, 2003, it called for a performance standard that would most likely require SawStop or something like it. In July, 2006, commissioners voted 2-1 to instruct their staff to draft a document starting the rulemaking process. Called an Advanced Notice of Proposed Rulemaking, it would have been published in the Federal Register with a request for public comments. Then things took a bizarre turn. Within days of the vote, commission Chairman Hal Stratton, who had voted yes, resigned to join a law firm. The resulting 1-1 stalemate meant the rulemaking notice could not be approved. This was during the Bush administration, which was stridently anti-regulation. The commission would go three years before getting a third commissioner and again having a quorum. Even as the threat of regulation eased, the industry faced trouble in the courts. Carlos Osorio was a computer technician from Colombia who moved to the Boston area in 2003 to be near his girlfriend. Unable to find work in his field, he took a job as a flooring installer and learned to use a table saw. During the trial of his lawsuit in February, 2010, in federal court in Boston, Osorio admitted he was working without a saw guard, and said guards were not used by anyone on his crew. Before SawStop, this fact alone would have made a successful lawsuit unthinkable. But Gass testified about his efforts to license SawStop to Ryobi and others. He said that Osorio almost certainly would have escaped serious injury had SawStop or another skin-detection system been in use. The jury awarded damages of $1.5 million. About 70 of the roughly 150 cases have been settled, said Sullivan. Only two, besides Osorio, have been tried. A Los Angeles case last year ended in a hung jury, then was settled. In the other, tried last July in Chicago, Ryobi was victorious. The plaintiff was Brandon Stollings, who suffered the amputation of two fingers while installing flooring at his mother’s house in Wisconsin in May, 2007. Stollings, then 23, had been captain of his high school basketball team, and had passed on college to pursue his goal of becoming a homebuilder. He testified that after the blade sliced into his hand, he began running around in circles in his mother’s yard, screaming in pain and terror about what had just happened. Stollings, who had years of experience with table saws, testified that he was not using a guard and never did because it got in the way. Gass testified that Stollings would have escaped serious injury if the saw had skin-sensing technology. This time, however, Ryobi’s lawyers shifted the focus from the maiming of a young man to a purported conspiracy between plaintiffs’ attorneys and Gass—designed to bleed the industry by, in the case of the lawyers, filing lawsuits; and in the case of Gass, forcing manufacturers to adopt SawStop. The jury found Ryobi not liable. Rows of gleaming patents for saw components cover entire walls. Those patents have become an obsession of the industry as it fights to keep the CPSC off its back. Legislation passed by Congress in 2008 had resuscitated the agency, adding funding and expanding it to five commissioners. Yet the table saw issue stalled. In November, 2010, —the National Consumers League fired off a protest letter to commission chairman Inez Tenenbaum. The league arranged for several injury victims to meet with commissioners. In October, 2011, they voted 5-0 to publish an Advanced Notice of Proposed Rulemaking–the step nearly taken five years earlier. 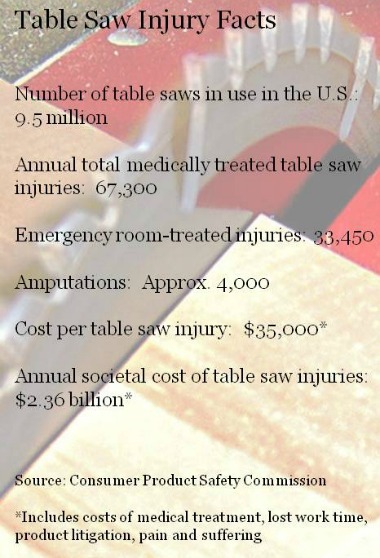 In the notice, the CPSC pegged the average cost of a table saw injury at $35,000—for a total cost to society of $2.36 billion for the estimated 67,300 injuries per year. The Power Tool Institute disputed the estimate as highly exaggerated. And in comments filed with the commission in March, 2012, it said a federal regulation would grant a “monopolistic advantage’’ to SawStop, whose patents might shut out rival safety systems, such as the one developed by the joint venture. Further, the industry reminded the commission of a legal constraint that could block regulation. By law, the commission must defer to voluntary standards that could adequately improve safety. As a result, by revising a voluntary standard, or by simply working on revisions, an industry might be able to forestall regulation indefinitely. The industry had, in fact, made a couple of changes to its voluntary standard. A 2005 revision provided for use of a riving knife; another in 2007 called for an improved blade guard. Since late 2007, hundreds of thousands of saws with the new guard had come into the market. Therefore, the industry said, before adopting a regulation the CPSC must investigate the impact of the changes. The agency has agreed to study consumer usage of the new guards. Expecting little from the CPSC, SawStop tried another way to force the issue. Last year, it lobbied the California legislature to pass a bill requiring injury reduction technology for table saws sold in the state. California is such a huge market that when forced to meet its design standards, companies sometimes apply the changes across entire product lines. The bill was defeated, however. SawStop could make plenty of money if a table saw standard were adopted, but is profitable just selling its saws, according to Gass. Lilly Fowler of FairWarning contributed to this story. FairWarning (www.fairwarning.org) is a Los Angeles-based nonprofit investigative news organization focused on public health and safety issues. Would You Want to Do Business With This Man?